Sometimes I wish I was the kind of woman who makes herself look neat and chic in tones of black and grey. Then I see a bright red clover print dress and realise I don't want to be that person at all. Colour makes me very happy, and colourful pattern makes me even happier. 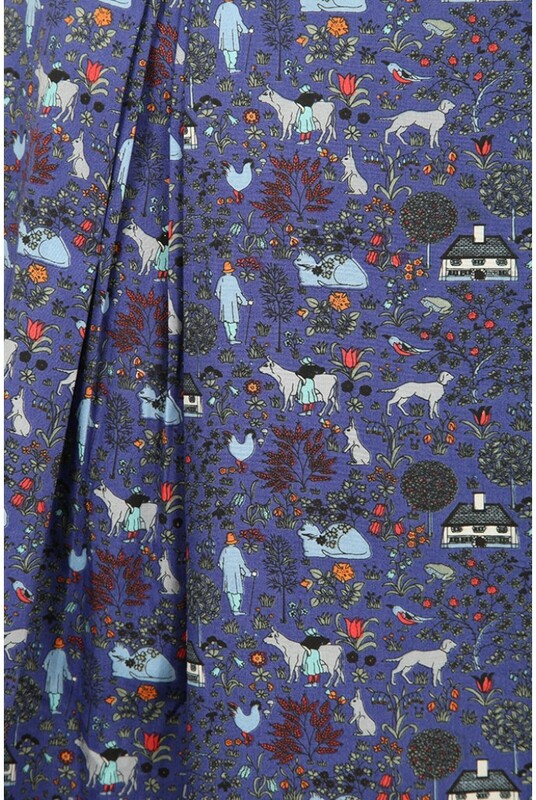 I fall in love with a new high street print almost every day, so consider this a colourful parade of my latest crushes. 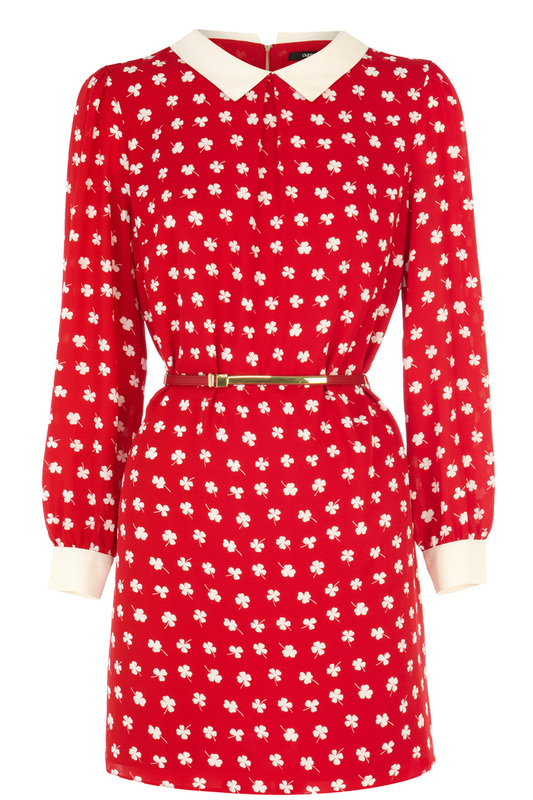 I'd definitely try staying up all night to get lucky in this Clover print tunic dress. It's £50 from Oasis. 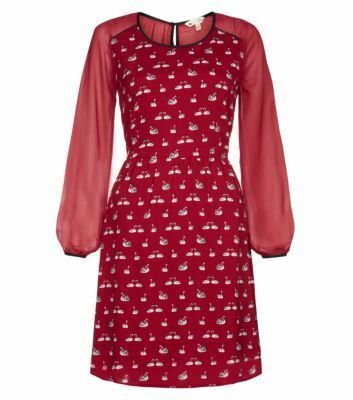 Why stop at one red patterned dress? 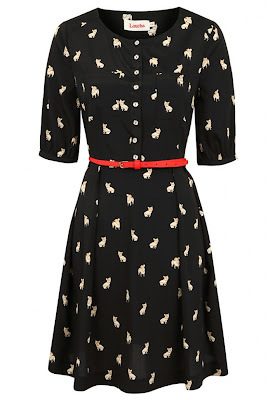 This Yumi dress, available online at New Look has lovely flattering 70s-style sleeves, and is decorated with a pattern of lots of little swans. It's a bit hard to see that from the picture, isn't it? Let's have a closer look. This bevy of swans is available for £45.99. 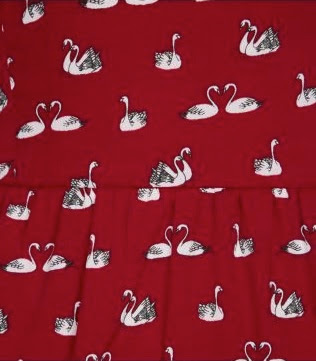 ASOS, meanwhile, are selling a glamorous '40s style dress in their petite range, complete with a different swan pattern for only £29. 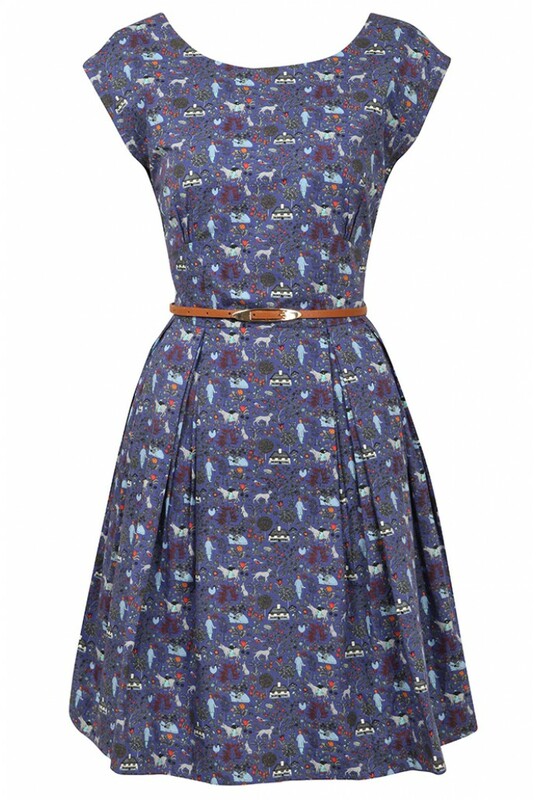 It's only left in a size 8 left, so definitely worth getting in a flap about if that's your size. 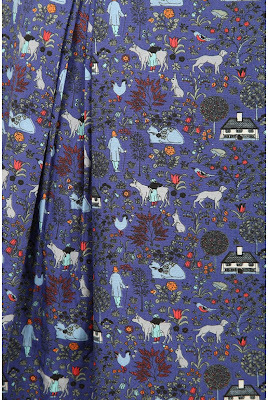 Louche are a reliable source of pattern happiness. If I'm down in the dumps, going into Joy and stroking a few of their dresses always seems to do the trick. This is a gorgeous cotton number, the Julita Country dress. And very country it is too, featuring a scene of bucolic bliss. There are cows being milked and hens and rabbits and frogs running round amidst farmyard flora. It's got a lot going on for £59. Louche again, and they've come up with something to possibly worthy of succeeding the mighty M&S pug dress. 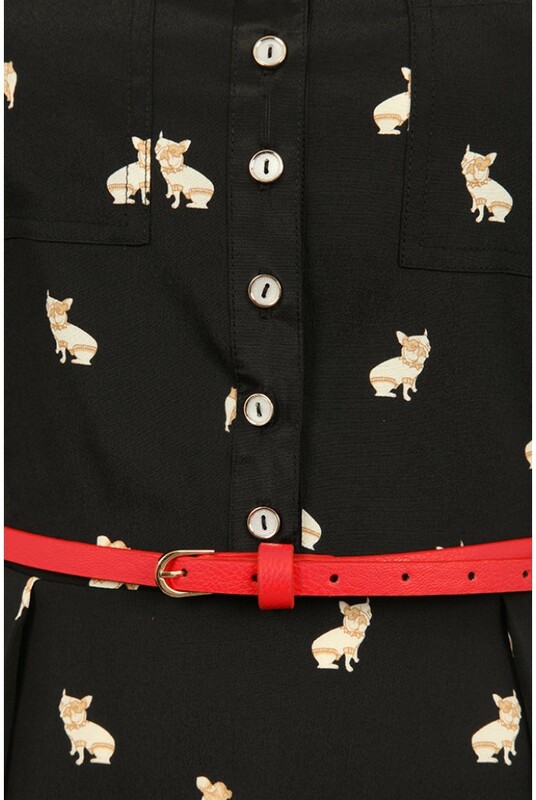 Though this design is called the Catnna, it's actually covered with dogs - French bulldogs to be exact. Aww, there they are. Regardless of the novelty of print, it's a good classic dress shape and I bet you'd get your £59 worth of wear out of it. 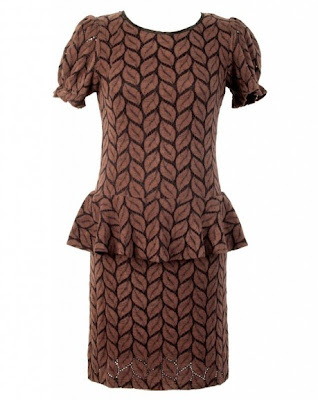 I'm less sure about the shape of this one but I couldn't resist the Wonderland leaf dress, simply because it uses the most autumnal of patterns. Probably because of the shape (it'll look much nicer on, I think), it's on currently sale, reduced to £20 from Mina. For another plant print in a possibly more flattering shape, take a look at M&S's leaf print dress. And I know only the model pictured could probably get away with wearing this dress in real life, but I couldn't resist sharing the amazingness that's the pattern on this House of Holland brooch maxi dress. Available from Urban Outfitters for £120, it's from a collection called Rave Nana, and is decorated with a pattern featuring dazzling brooches, over-flowing cocktail glasses and elegant cigarettes. Take a look at the cigarette dress from the same collection while you're at it. With her bad habits and love of sparkly things, this Rava Nana sounds exactly like the kind of lady I want to be when I grow up. And probably there lies the reason why you'll never find me in refined shades of black and grey. I'm simply getting in practice now. I've looked at the clover dress a couple of times now and I still can't tell if I like it or not. No? What don't you like about it? I think it might look nicer in a different colour. I love the collar and cuffs, but something about it has stopped my trying it on. Three times. Cows being milked, though? YES PLEASE. Is it a very tomato red in real life? I shall seek it out and report back. And YES to the cows. Always. Sorry but the pug dress will never be beaten! I have a photo of my pug in a Veloceraptor outfit which will back me up! Also just because it says it is a french bulldog print, I can't be 100% sure that it is, it looks more boston terrier to me! Yes, I'd be very grateful for someone with more dog-related knowledge than me to confirm if they are indeed French bulldogs! I wasn't sure myself.